Simple and easy to use is often confused with basic. Movie editors aren’t as ubiquitous as photo editors. And there are precious few variants in the market that bring together qualities like user-friendliness with a robust, mature features set. Today we are going to introduce you to an application that packs a punch in terms of its bells and whistles. Yet provides an uncluttered interface that you can master in 10 minutes flat. No kidding, we timed ourselves! Meet the Movavi Movie Editor. Home videos are rarely as polished as professional cuts. They have shakes, haziness and destabilization. In short, they need a fair bit of editing to entertain and delight. This is the reason why home video editors tend to be resource hungry. Movavi isn’t. The advantage it offers in the form of its minimalistic UI is complemented by its ability to conserve memory space and CPU cycles while working. 1. Video Voice-overs. This is extremely useful, especially if you are creating online courses or instructional videos and do not have access to a screencast solution that also offers quality sound overlay. With the Movavi Editor, hassles with cleaning up audio are a thing of the past. Just launch the application by clicking the icon on the desktop. Next, select the “Import” option from the vertically stacked navigation menu to the left. The option that you need to go for is “Add Media Files”. 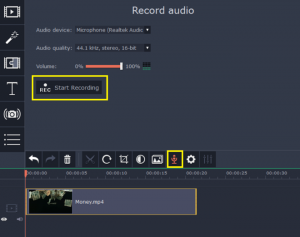 Now you can choose a pre-recorded video (or screencast) from your hard drive and drop it on the editing timeline. Finally click the small “microphone” icon from the array of tools above the timeline. You have the ability to add a voice-over to the selected video file without any extra preparation. The exported content is seamless. You get clear, intelligible audio as well as a well-shot video without giving the impression that a voice-over is involved. 2. Frame by Frame Stabilization. Stabilization used to be the domain of professional editors. It involves actually altering the quality of a pre-recorded video file and takes time to execute. That was before Movavi Video Editor. With this application, even something as complicated as frame by frame stabilization is accomplished in only a few clicks. Simply select the hamburger icon from the menu to the left and from the tabs revealed, go for stabilization. If the video files with the shakes is already on the timeline, you can directly click the “Stabilize” button. The modal that opens up lets you fine tune the accuracy and reduce the shaking of each individual frame of the video file. The sliders make the process relatively hassle free. 3. Filters & Transitions. Who doesn’t crave the “larger than life” movie feel? A lot of the magic comes from the intricate special effects that are woven into the video files to intrigue and captivate viewers. Your home movies don’t need to lag behind. 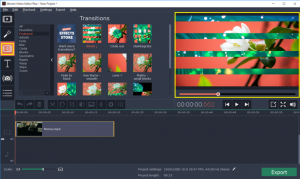 Movavi lets you apply one-click filters and transition effects to your pre-recorded video files. There are dozens of popular categories to choose from. You can add flying objects to frames for a kitschy feel. Vignettes and Retro are classics that are now at your fingertips. Artistic, Faded and Geometric transitions carefully vetted for maximum impact can truly take your home productions a notch higher. 4. Format Conversion. 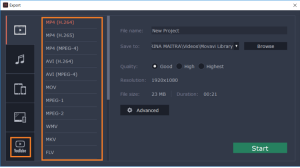 The latest version of the Movavi Video editor comes bulked up with the ability to handle video files in raw format with large volumes of unprocessed data. 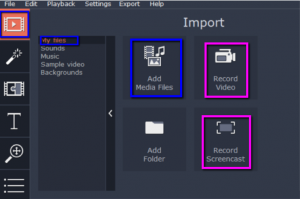 Furthermore, the Export Video tab in the top navigation converts an output file (edited source file) to dozens of common and rare extensions that cater to Apple smart device users as well as Xbox and PlayStation evangelists. These features are just the tip of the Movavi Video Editor iceberg. 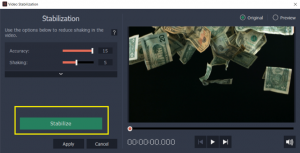 Filters and transitions can be combined, the Chroma Key (green screen) effect activated, and text and captions can easily be added to video content. 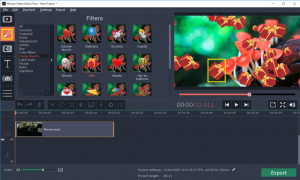 Do you know of a more robust and easy to use video editor that is at par?